The cover and letter of transmittal for our 2016-17 annual report. We partner with departments and agencies to transform government services. We inspire, demonstrate, enable and assure successful service transformation. This document must be attributed as the Digital Transformation Agency Annual Report 2016–17. I am pleased to present the inaugural Digital Transformation Agency’s Annual Report for the year ending 30 June 2017. The report has been prepared in accordance with applicable obligations of the Public Governance, Performance and Accountability Act 2103 (PGPA Act). The report information contains details of the Agency’s general organisation, administration and performance to 30 June 2017, as well as the DTA’s audited financial statement as required by section 43(4) of the PGPA Act. In accordance with Commonwealth Fraud Control Framework, the agency has appropriate fraud risk assessment and plans in place. 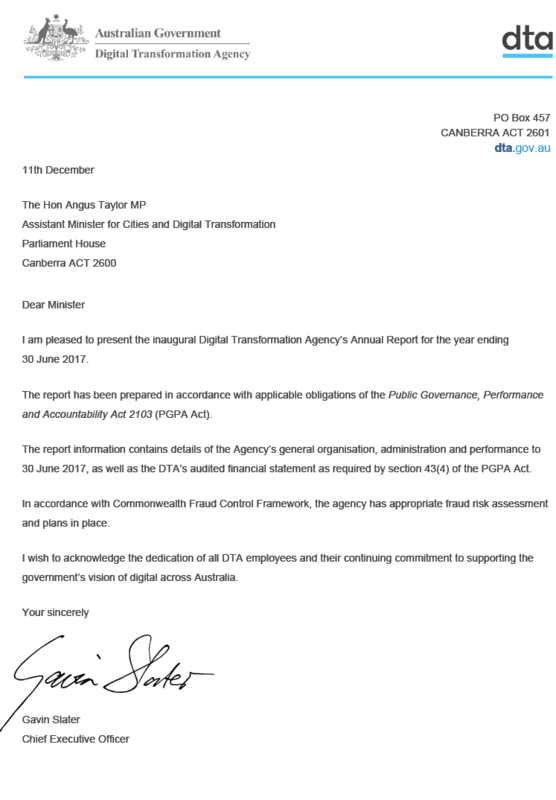 I wish to acknowledge the dedication of all DTA employees and their continuing commitment to supporting the government’s vision of digital across Australia.